The Art Collection at Levi’s® Stadium celebrates the 49ers legendary history and highlights diverse, local artists. 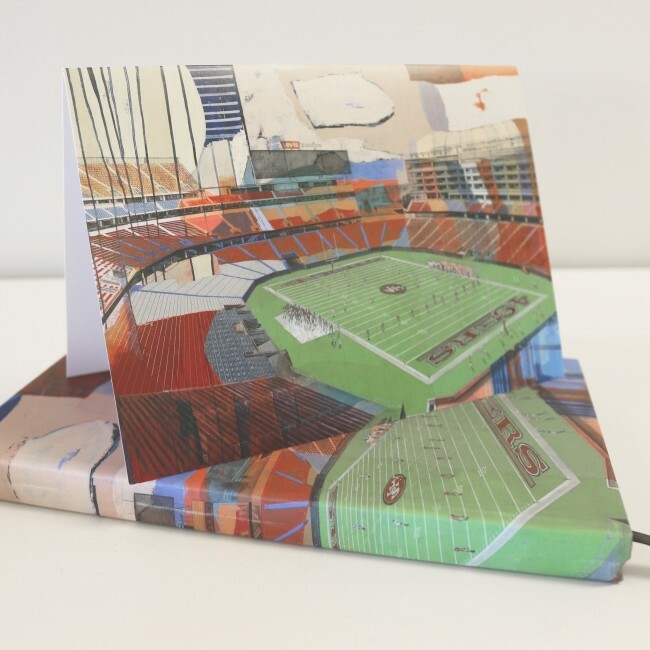 The 49ers are thrilled to present an exclusive stationery set straight from the Levi’s® Stadium Art Collection. 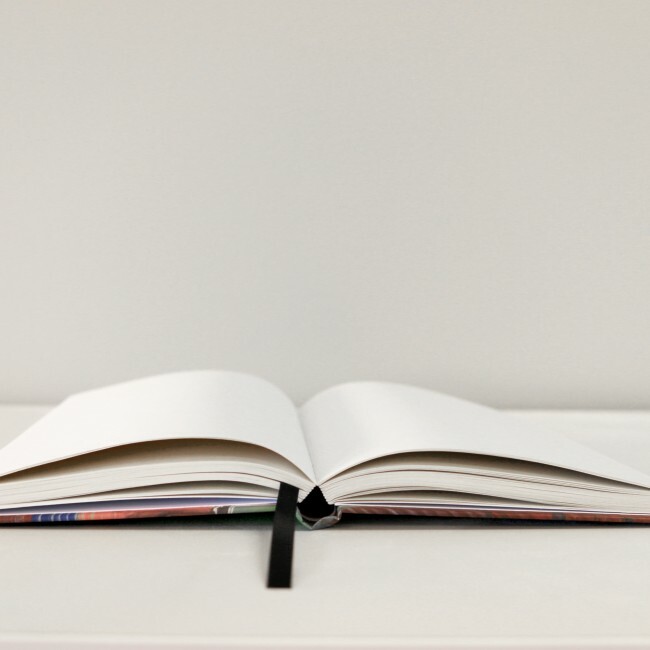 Our artist journal which features cover artwork by Derek Gores and Stanley Silver, invites you to record your original ideas, splashing moments and memories on each page to create your own layered, necessary work of art. 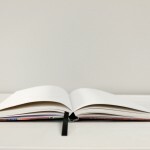 The journals are 5 x 8.25 with a hard cover binding and 240 unlined pages. 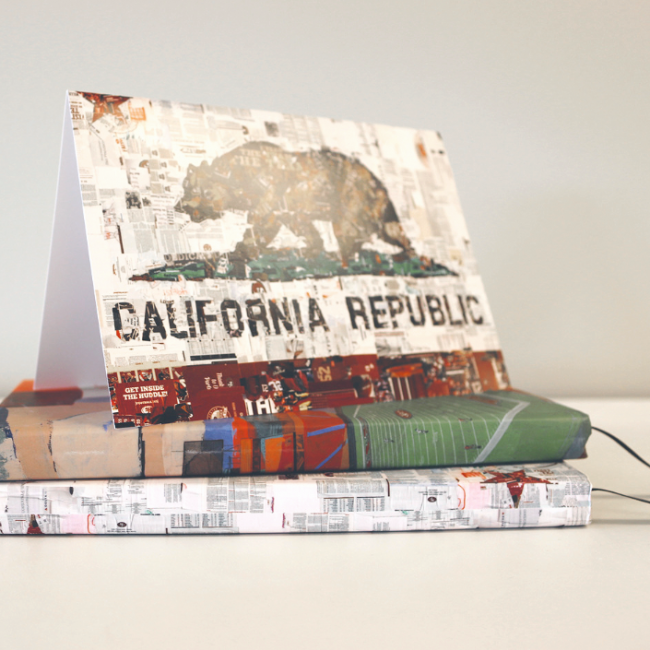 Our note card set comes in a box of 8 cards and 8 white envelopes. The note card set features artwork by Derek Gores and comes blank to be personalized for any occasion. Note cards are 5 x 7. 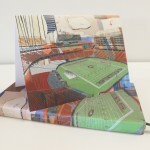 The note cards and journals can be purchased separately or together as a set at any 49ers Team Store locations. Derek Gores is best known for his torn paper collage works, utilizing found materials like photographs, historical data, maps and memorabilia to create captivating new images on canvas. Gores exhibits in galleries around the world and was honored as one of 15 artists selected for the Manifest Hope DC exhibit, prior to the 2009 Presidential Inauguration. 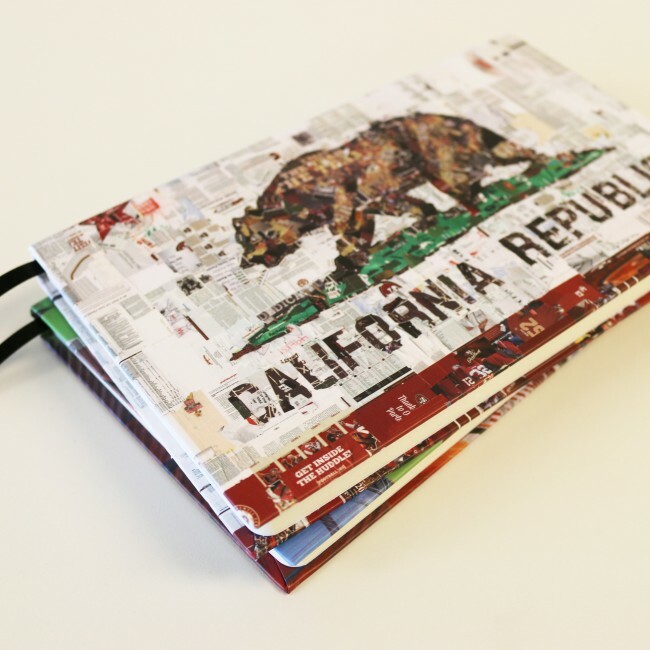 His commission clients include Prada, SONY, Dwell Magazine, the Cosmopolitan Hotel Las Vegas, and the Kentucky Derby. 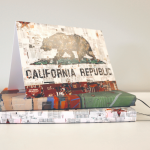 The California flag piece is made up of old 49ers materials, including tickets, season schedules, and game day programs! Stanley Silver’s art has been exhibited in prominent galleries and museums throughout the United States and has been selected as the “official artist” for many prestigious sporting events including the MLB World Series and All-Star Game and the New York Marathon. Hollywood has embraced Silver’s art for years. Most recently, Silver’s art captured the attention of the set decorator, cast and crew of the hit TV show, Entourage. The colorful Levi’s® Stadium field piece was created by Silver to honor the design and atmosphere of the new home of the 49ers. Both pieces are featured in the Levi’s® Stadium Art Collection, housed in various club and suite levels throughout the building.